Note: This module does not suitable for IOS system. Backplate settings LDO input voltage of 3.6~~6V unpaired current is about 30mA, paired 10mA, input voltage prohibit more than 7V absolute prohibition of reverse power! 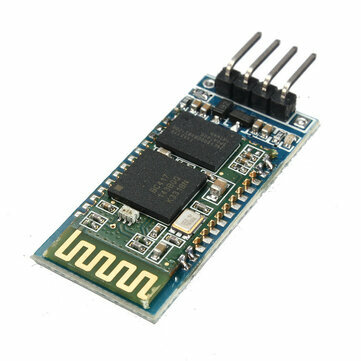 Interface level 3.3V, can be directly connected the various SCM (51, AVR, PIC, ARM, MSP430, etc. ), the 5V MCU also can be connected directly, without MAX232 can not go through the MAX232! The pair later when full-duplex serial use, do not need to know anything about the bluetooth protocol, but only supports 8 data bits, 1 stop bit, no parity communication format, which is the most commonly used communication format does not support other formats. Support to establish a bluetooth connection through AT commands set the baud rate, passkey, set parameters are saved after. bluetooth connection is automatically switched to the pass-through mode. Wireless serial bluetooth port with free extension cable. With transparent shrink tube, dust and beautiful, and there is a certain degree of anti-static capabilities. TXD: the sender, usually expressed as its sender, the normal communication must be connected to another device RXD. RXD: the receive side, generally expressed as the receiving end of their normal communication to another device connected to TXD.